The path to having it all starts with the right mindset. Can you have it all? Judging from the lack of raised hands when the question was posed to a room full of professionals, the answer is overwhelmingly “no.” However, the woman asking the question – inspirational speaker, corporate trainer and CEO of U & Improved Jodi Low – not only knows it’s possible, but also provides her audiences a pathway to getting there. “With the right skills, tools and mindsets, having it all is achievable,” Low says. 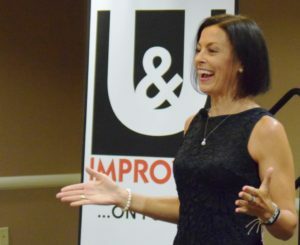 Jodi Low, president and CEO of U & Improved presents at July’s Professional Women’s Alliance. During July’s Professional Women’s Alliance, Low, told the audience that the path to having it all begins with the right mindset. She says there’s a notion that having it all means a perfect balance of career and personal life. Low challenged the audience to evaluate what the ramifications of perfect balance to determine if the idea is as desirable as it sounds. Setting realistic expectations of balancing your professional and personal life is vital to achieving your goals. For example, when you’re working on growing your business, there will likely be late nights and missed family dinners. Professionals must learn to expect and accept the ebbs and flows that accompany choosing to spend more time on one aspect of life. Prioritizing doesn’t equal failure, it simply means you’re balancing life to work toward achieving your current goals. “We all need to set a realistic expectation of what a perfect balance is,” Low said. Often, professionals are self-critical about not “having it all.” However, blaming yourself isn’t the way to get to where you want to be. Instead, it’s a matter of recognizing actions that do and do not work in favor of reaching your goals. Low pointed out that only 40 percent of daily decisions are made consciously, while 60 percent are determined through patterns and repetition. To have it all, the vital first step is identifying these personal patterns and determining whether they help or deter you from reaching your goals. The next Professional Women’s Alliance will be on Tuesday, August 8 featuring Kimberly Hall, Director of Donor Development, Goodwill of Central and Northern Arizona. Hall will discuss balancing pursuit of passion and purpose with work, family and other commitments. Register today!